In just about one week, leaders and elected officials from governments around the world will convene in Paris to agree on a framework for combatting climate change at the United Nations Framework Convention on Climate Change (UNFCCC) twenty-first meeting of the Conference of Parties (COP21). This major annual meeting comes at a crucial time: the impacts of climate change are occurring faster than many scientists have projected, as evidenced in the form of sea level rise, heat waves, and other damaging extreme weather events—and the agreement established in Paris will act as an outline and catalyst for future international climate action. Since the UNFCCC’s inception, the International Union for Conservation of Nature (IUCN) has been actively engaged in climate change policymaking to support ambitious and equitable action. The IUCN Global Gender Office (GGO) has provided technical guidance to Parties for many years to ensure that action is gender-responsive. By 2015, more than 50 UNFCCC mandates champion women’s participation, for example, and various aspects of gender-responsive planning and programming. The final negotiations toward a new climate change agreement, however, need to reflect this burgeoning global understanding of the linkages between gender equality and climate solutions, paving the way for a more resilient and sustainable future for the global community. Negotiations. We’ve come a long way. There’s still a ways to go. But a gender-responsive post-2015 climate change agreement is within our reach. 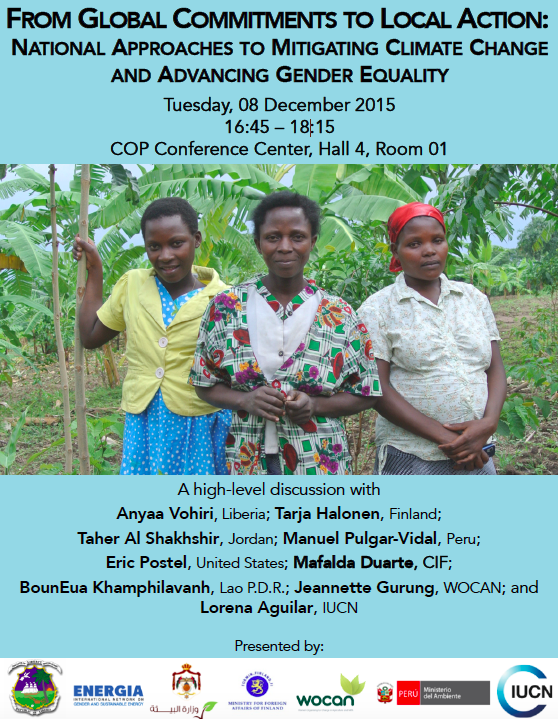 GGO technical staff and advisors will be at COP21 to help negotiators secure it (Read the IUCN position paper here). 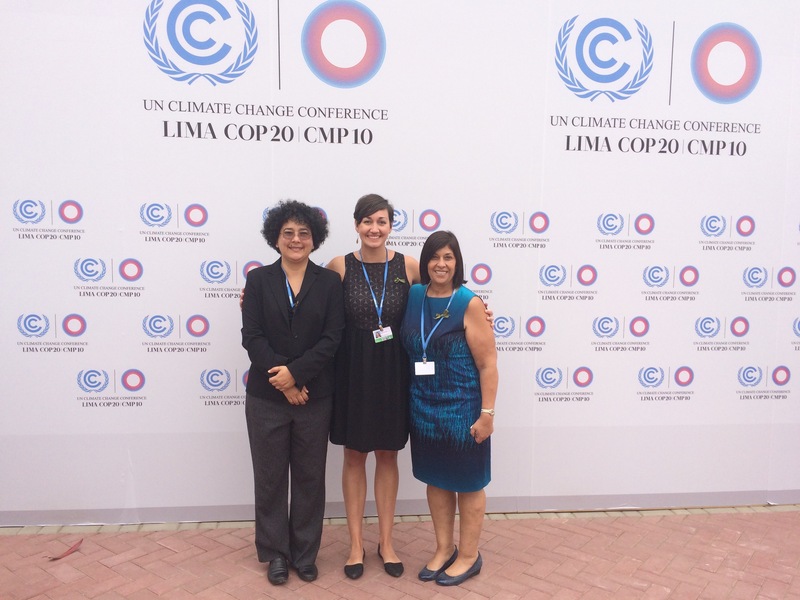 IUCN GGO team members participate at UNFCCC COP20 in Lima. Celebrations. In the spirit of marking the significant progress made integrating gender equality concerns throughout climate change decision making and initiatives at all levels, GGO is launching a brand new comprehensive publication, Roots for the Future: the Landscape and Way Forward on Gender and Climate Change. This expansive book—written in collaboration with a wide range of experts and fellow members of the Global Gender and Climate Alliance—will launch on the UNFCCC’s Gender Day, 8 December. Check out the GGO website and follow us on Twitter for more up-to-date information. The book launch is part of a special event that celebrates the tremendous innovations and leadership of women, in particular as awardees of the UNFCCC Momentum for Change: Women for Results initiative. The Momentum for Change initiative was launched to spotlight solutions to climate change from around the world. GGO’s Lorena Aguilar chairs the Women for Results pillar. Finally, also on Gender Day, 8 December, GGO joins with partners to celebrate multiple examples of progress at national level. “From Global Commitments to Local Action: National Approaches to Mitigating Climate Change and Advancing Gender Equality” offers high-level government representatives a chance to present and discuss their national strategies on gender and climate change – with a particular emphasis on gender-responsive mitigation. ETC/Energia and WOCAN join officials from the Governments of Finland, Peru, Jordan, the U.S. and others for this event. Climate change is a threat to every single human being on the planet; yet no one knows for sure what the severity of its future effects will be. Working together, our advocacy and support, in synergy with similar efforts from many other diverse sectors and actors, can help move governments to act boldly and make ambitious commitments—particularly for those who need this action most, like the women on the front lines of climate change. GGO hopes that these crucial upcoming weeks in Paris will help steer the world’s course towards a more secure, equal and sustainable future for all. GGO will be providing ongoing technical support throughout the two weeks of COP. For technical guidance on site in Paris, contact Lorena Aguilar, Ana Rojas, Cate Owren and/or Margaux Granat.